By stayhomecupcake on September 28th, 2009 . Filed under: Cupcake Ideas, Giveaways, Home Decor . You won’t believe your eyes! These cupcakes are the non-edible creations of Etsy artisan threerabbits. Each cupcake is made completely from non-food materials but SMELLS like a real cupcake! I can’t tell you how may friends and family have taken a second look to see if I had a real cupcake on my fridge. 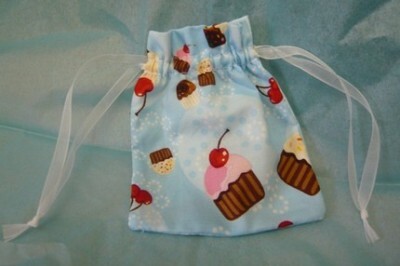 Threerabbits also sells these cute little cupcakes as decorations and these cupcake baggies. Just put one of the faux cupcakes (or cupfakes) in the bag and you have the perfect goodie bag for a cupcake birthday party! 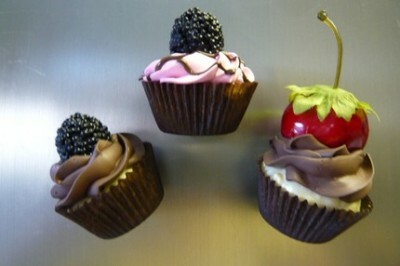 Threerabbits is now giving away this yummy looking cupcake magnet to one of you! Just go to her shop and come back to ATC and leave a comment in the comment area about what item (or items!) you liked best. The winner will be announced on Monday, October 5th. Thanks threerabbbits! Visit stayhomecupcake’s shop on Etsy. Mouse Eating Cupcakes Magnet. Now that’s adorable! The mini faux vanilla frosting cupcake!! I could just eat it. Wow! They’re all adorable but the mini pink berry cupcake is the cutest! And it smells like a cupcake too? That settles it, I’m in love. I would have to say that my favorite is the 3 mini cupcakes they are sooo awesome looking! Being a cake decorator myself who makes cupcakes those looks soo realistic! Such a cute site! I love almost everything on there but I have to say my favorite is the three minin cupcakes, partly because i’m in love with the one with the cherry on top! I’m also loving the mini glass vases, and the loved butterfly heart magnet. I like the vanilla frosting one! Thanks for the giveaway! I just love love love the cupcake magnets! I think they would be perfect on my fridge! Since I am perfecting my cupcake recipes this will give me great inspiration every time I go to the fridge. I actually liked the magnets best, and I would love to have them on my fridge! By the way, I really like your blog and visit it regularly. Thanks for the awesome giveaway! My fave items are the HALLOWEEN TRIO OF FAUX cupcakes! They would be such fun to give to my daughter! I love the magnets because I’m a manget fanatic. I LOVE the fairy proof cupcake in a jar! That is too adorable! Wow, they look so real!!! Besides the cupcakes, my favorite item is the garden gnome magnet. So adorable! I love the faux halloween cupcakes the best. So cute! I love the mini bud vase….although everything on the site is absolutely darling!!! I am obsessed with cupcakes and find your site so easy when it comes to wonderful finds such as these!!! I must have replied to the wrong one! But as I said there, I have to go with the mini vanilla cupcake. The huge berry on top looks too yummy to resist. And vanilla is the best stuff ever! Even though purple is my favorite color, that berry will have to be purple enough! Can’t wait to see more from you! Mini Faux Vanilla Frosting CUPCAKE is to die for! So cute, you could just eat it up! Kudos! Mini Faux Vanilla Frosting CUPCAKE is to die for! So cute, you could just eat it up! Kudos to you! The Mini Faux Vanilla Frosting CUPCAKE is adorable! So cute, you could just eat it up. I love the magnets! Especially the chocolate red raspberry one. I love everything….Cupcakes and Disney are my two favorite things and the Mickey pot holders made me smile! I also loved the little mouse eating the cupcake!! Adorable! Halloween Faux Cupcake with Mummy is really cute! These magnets are adorable! I also love, love, love the WHAT — Mouse Eating Cupcakes magnet. Thanks! love the mini cupcake magnets! Cupcakes make the world go ’round! 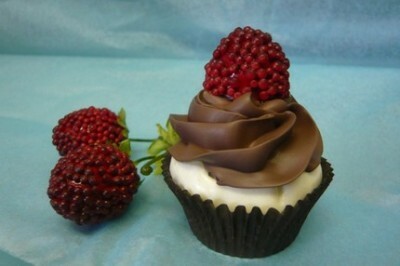 The berry cupcake is absolutely beautiful! the yellow cupcake pincushion witht the cupcake pins! The Halloween Faux Cupcake with Mummy is just too darling. Oh my goodness! These are really cute, I don’t know how I missed this post, but I did! I love the chololate frosted cupcakes, and the halloween ones are adorable too! those r just adorable… everything has a cupcake on it simply screams buy me,, take me,, u want me…. Oh my gosh they look so real… Other than the cupcakes i love the garden gnome magnet! They’re all so cute! Oh my goodness! How precious are those!!! I have to say that I fell in love with the baby mitts. I’m about to have a baby myself and if I can get those in blue, I’ll get them for my little boy. SO cute. I love the Three Mini Cupcake Magnets. I love the shape and colors of cupcakes and these examples are super cute! Halloween is my favorite holiday so, I LOVE the Halloween cupcakes!! I have to say my mouth was watering at the site of those faux halloween cupcakes!! Too good to be true!! I just absolutely love these cupcake magnets!! I love,love,love anything cupcake! Those magnets are so adorable! Love the chocolate cupcake magnet with raspberry and chocolate drizzle – makes me want to eat a cupcake right now! Fairly nice submit. I just stumbled upon your webpage and wanted to say that I’ve genuinely loved looking your weblog posts. In any case I? ?ll be subscribing to your feed and that i hope you create again soon! Totally in love with your tallent to make such scrumdiddlyumtious pink cupcake art! Your so fab! love, love, love the smile they put on my face. Thanks.